Before this picture came out, its production problems were legendary: shooting a large scale action film entirely on water, suffering through massive hurricanes which destroyed its multi-million dollar set, producer-director squabbling between the Kevin Costner and Kevin Reynolds, not to mention the shear ludicrousness of remaking one of the great action films of all time, “The Road Warrior”, on water! “Waterworld” seemed born to fail. Yet, despite all the strikes against it, “Waterworld” is a guilty pleasure of mine. Kevin Reynolds actually has some talent as a director of action. With most of its $175million actually on the screen, Reynolds’ production team were allowed to surmount the production nightmare of shooting action on water and craft some visually stunning action set pieces. If you accept its ludicrousness as 'camp', "Waterworld" can be enjoyed as one of the great unintentionally hilarious films ever made. The late trailer voiceman Don Lafontayne’s opening narration explains the very simple scenario to us. The polar ice caps have melted and the entire world is covered in water. Those who survived have adapted to a new world of water. Kevin Costner’s man with no name character is a wandering warrior plying the seas, surviving by trading like all other wanderers. Costner and his boat are completely self-sufficient; he's got his own guns, harpoons, and other weapons to protect himself, his own plants, tools, reading material. He's even got a device that turns his piss into fresh water! When he goes to trade some goods at an atoll/floating city he’s discovered to be a ‘mutant’ with gills. The prejudiced city-folk imprison him and sentence him to death. Before that happens the evil plundering ‘smokers’ attack the city. 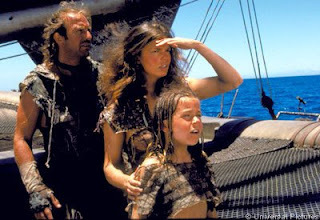 Costner escapes with the help of Helen (Jeanne Triplehorn) and a little girl named Enola (Tina Majorino). When Costner discovers the girl holds the key to finding the elusive ‘dry land’ he finds himself battling the smokers to protect himself and his new found friends. The Kevins (that is, director, Reynolds and producer, Costner) stage two wonderfully imaginative action set pieces in the first half – the opening attack scene on Costners catamaran and the attack on the floating city. Though initially skeptical about the concept, having these scenes in the first half allowed me to suspend myself disbelief to this truly ridiculous world. For most people though getting past the idea of Mad Max on water was just insurmountable, and I respect that. If you can’t accept this scenario, then every ridiculous moment (and there are many) will become amplified to the point of anger and annoyance. If you accept the scenario you would find Kevin Costner’s catamaran a really great piece of production design from the Dennis Gassner. The attention to detail in crafting the numerous ramshackle devices Costner’s character creates from cobbled-together spare parts is admirable. In the days before CGI, Gassner's tangible retractable sail and mechanical wheels and pullies which makes it work actually looks functional. Even Costner’s ‘urine-to-fresh water’ device is given a close-up to showcase its detail. Of course, if you can’t suspend your disbelief the ridiculousness of these devices are just plain laughable. In a world without land, somehow these citizens of the water have skidoos, electricity, helium filled balloons, operational motor vehicles, cigarettes, etc etc. Guilty pleasure or not, the absurdities do compound on one another and barely hold together as a credible story. The filmmakers treat Costner’s character arc with such seriousness, his tortured wanderer/western anti-hero persona, allegories to the classic western genre heroes from “Shane” and “The Searchers”, reaches way too far. Dennis Hopper, who plays the leader of the smokers, is the only actor who plays his character with the right tone. He provides the camp humour the audience requires to accept this film as entertainment and not vanity. Modern films like “Snakes on a Plane” embraced its campiness, which became a selling point and made it acceptable for audiences to enjoy. Unfortunately, despite some great imagination and surprising filmmaking skills, “Waterworld” became a laughing stock of Hollywood. If you need to see a three-hour version of the film, it’s now available from Universal Studios Home Entertainment, as “Waterworld: 2 Disc Extended Edition”. Have to agree. This movies reputation preceded my watching it. I watched it anyway, even though I have a hard time 'suspending' my imagination but I bought into it and enjoyed the film.